A couple days ago, I wrote about verifying bulk listings in Google Places and my concern about the process. My concerns have been alleviated to some degree because I have since received a confirmation email from the “Google Team” about my bulk upload verification request. Even more reassuring – the Google Team email comes from “Local Help”. While I am not absolutely certain, I don’t recall ever receiving an email from Google regarding any other issue I have had with a Google Places listing. Maybe Google really is taking communication with local businesses seriously. At least in this case, the Google Local Help Team appears to be concerned enough with bulk verification upload requests enough to provide an email response. 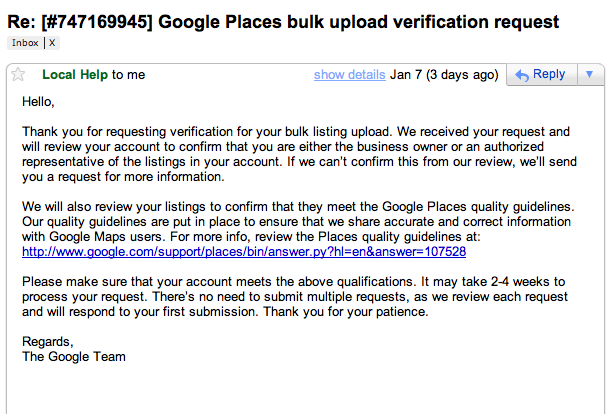 Because I have received an email confirmation from the Google “Local Help” team, I am somewhat optimistic their bulk verification upload process may actually produce the successful publishing of my bulk Google Places listings. This entry was posted on January 11, 2011 at 10:05 am and is filed under Bulk Upload Verification Request, Google Places, Google Places Bulk Verification Confirmation Email, Google Team. You can follow any responses to this entry through the RSS 2.0 feed. You can leave a response, or trackback from your own site.